Madhavbaug Clinic With more than a decade of expertise in preventive cardiology, Madhavbaug has a strong track record of patients who have obtained relief from life threatening diseases with Madhavbaug’s treatments. Founded in 2006 with a vision to reduce the mortality and morbidity due to heart disease and lifestyle disorders, Madhavbaug has established a strong foothold in non-invasive cardiac care with 135 clinics and 2 hospitals. Our legacy is an outcome of our deeply ingrained philosophy of Whatever It Takes which is a promise of doing everything possible to provide the best cardiac care to our patients. OUR TREATMENT PHILOSOPHY Madhavbaug has successfully established itself as a dependable option for treating heart ailments – treatments that don’t just heal ailing hearts but strengthen them. A team of dedicated doctors from fields of modern diagnostics, Ayurveda, diet and physiotherapy guides you on the process to better heart health. HOLISTIC NON-INVASIVE TREATMENTS Madhavbaug has successfully integrated the knowledge of Ayurveda and optimal lifestyle modification with the insights of modern medical science to deliver world class non-surgical heart treatments. ADVANCED RESEARCH & TECHNOLOGY In-depth researched treatments, diets and protocols backed with proven efficacy makes Madhavbaug’s treatments reliable and effective. PATIENT-CENTRIC CARE Our philosophy of Whatever It Takes is a promise of best possible care and hand holding for the patients during and even after the treatment. VISION Our vision is to be the best cardiac care organization in India and to reduce the mortality and morbidity due to heart disease. MISSION Our mission is to rid the society of heart disease through well researched innovative therapies based on Ayurveda and modern, public education and extensive reach. The prevalence of high blood pressure has risen by approximately 8% in the last decade. This trend is mainly because of urbanisation as it fosters poor eating habits, a sedentary lifestyle, and low levels of physical activity which are the main causes of hypertension. Madhavbaug recognizes the 4 stages of hypertension and treatments are accordingly based on the severity of the condition. Madhavbaug’s holistic approach to blood pressure management includes changes in lifestyle, diet, and exercise along with Ayurvedic treatments and yoga. It is found that aerobic exercise can reduce blood pressure by 4-9 mm Hg while the DASH (Dietary Approaches to Stop Hypertension) diet is linked to an 8 mm Hg reduction in blood pressure levels. Ayurvedic and yoga therapies augment the body’s natural healing and self-repair abilities to help treat and prevent hypertension. 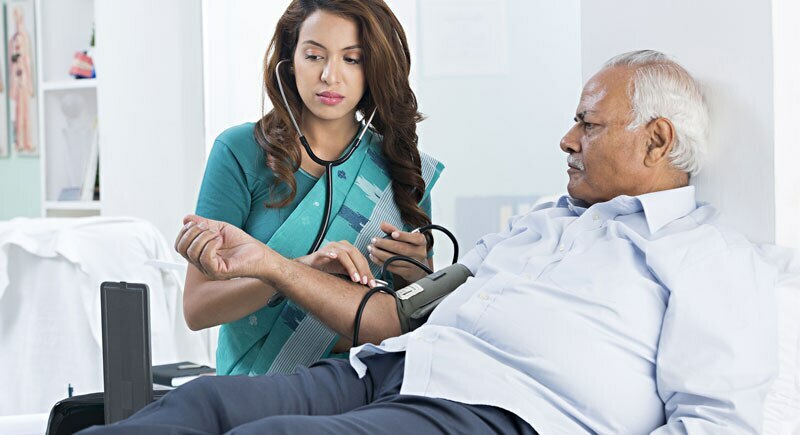 Madhavbaug’s treatments rely on science-based approach to blood pressure management and can provide same benefits as conventional hypertension medications without the risk of side effects. About Blood Pressure Management Program Madhavbaug’s ApexBeat programs use cutting-edge diagnostics and the latest research for prescribing specialized diet and physiotherapy routines, along with appropriate lifestyle modifications to manage blood pressure and reduce the risk of heart disease. The primary goal is to restore blood pressure to a healthy range of below 120/80 mm Hg and above 90/60 mm Hg. In the Blood Pressure Management Program, patients are provided with advice on strategies to control blood pressure and prevent complications. For those that have high blood pressure and suffer from some complication already are counselled on the risks of unmanaged blood pressure, with a strong focus on strategies to control blood pressure and lower the risk of heart failure, while for patients with early signs of lack of blood supply to heart, advice about techniques to prevent ischemic heart disease is provided. WHAT OUR TREATMENT ENTAILS 1. B.P NORMALIZED TO LESS THAN 120/80MMHG 2. FREEDOM FROM SYNTHETIC MEDICINES 3. PREVENTING LIFE-ALTERING COMPLICATIONS LIKE HEART DISEASE & STROKE Madhavbaug’s 360° Approach to Control Blood Pressure MODERN DIAGNOSTICS Modern diagnostics ensure that critical parameters and vitals of each patient are accurately assessed for further prognosis DIET Customized diet plans as per individual’s body class, which fulfills energy requirement of patient according to disease status and help proper control of blood pressure THERAPY ORAL Oral herbal medicines that cause no side effects are used to excrete extra salt and water from body which helps dilate blood vessel. ADVANCED AYURVEDA Ayurvedic procedures like Centripetal Oleation, Thermal Vasodilation, and Shirodhara that form the core of the blood pressure management program. CONTINUAL EXPERT CARE Our patient care and hand holding extends even after the completion of treatment where patient care executives and experts are at your disposal if required.